What constitutes rudeness? In Germany, a perceived slight is more likely to be connected with the the violation of a friendship than it is in other countries, according to research carried out at the University of Lancaster. 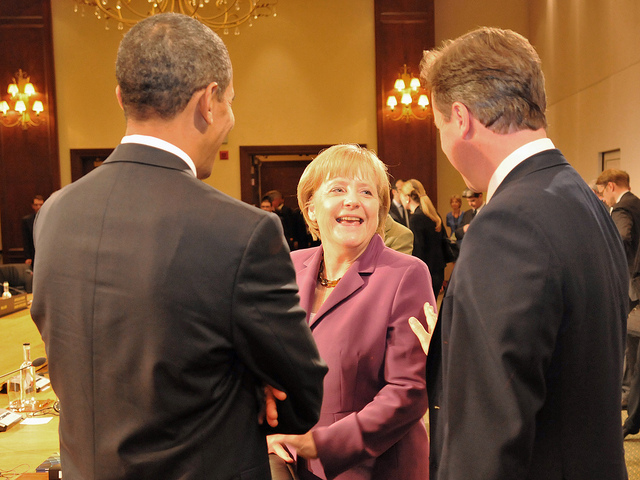 So Angela Merkel’s outraged response to revelations of phone-tapping by the US – ‘Spying between friends – that’s just not done’ – may have its roots in these cultural differences. The English, meanwhile, are more likely to be offended by behaviour which is seen as an attack on their social standing or self-esteem, according to the study of 500 university undergraduates in Germany, Britain, China, Turkey and Finland. The researchers, who asked 100 students in each country to keep a diary of conversations which made them feel offended or embarrassed, noted social networks in Germany tend to be quite tight. “The German informants may have perceived association violations in the context of a tight network of friendships particularly strongly,” they said. Other research has suggested friendships in the US may be different, the Lancaster team say: “While Americans tend to enter into many informal associations of a friendly character, in Germany “private” activities are limited to a small group of “selected” and longstanding “real” friends. In England and in Turkey, meanwhile, respondents were more likely to mention incidents in which their personal abilities or appearance were denigrated. But in Turkey, the offence was more likely to be associated with public humiliation than it was in England. The Chinese, however, were more likely to be offended by a perceived injustice – a trait perhaps associated with the influence of Confucianism, which values balance and equity. “This fits the idea that British culture is more individualistic, whereas Chinese culture emphasizes one’s position in the group and social reciprocity, for example reciprocal gift giving and returning favours,” said Professor Jonathan Culpeper, who led the research team. Further research by Prof Culpeper also suggests popular conceptions of British ‘politeness’ as being associated with a desire not to impose are wrong. An analysis of the Oxford English Corpus, a collection of more than 500 million English words and phrases, found politeness was most oftent associated with friendliness rather than with reticence. And historical work suggests the English may not, after all, be becoming ruder. During the 17th and 18th Centuries, Prof Culpeper found, more than half the 1000 requests in documents he studied were in the form of a direct imperative: “Give me water,” “Get thee to bed.” In present-day texts, just 10 per cent of requests were made in this way. “The point is that impoliteness is perceived to be a big deal today because perceptions of impolite usage are changing, as are habits in talking about it” they say. The team’s research was showcased yesterday (November 4) at an event which formed part of the Economic and Social Research Council’s annual Festival of Social Science.